"Website" → "Settings" → "General"
You can change the default favicon to upload an image to replace it. Beyond the favicon just showing up in your favorite browser, the favicon will also be utilized on mobile devices and Facebook. 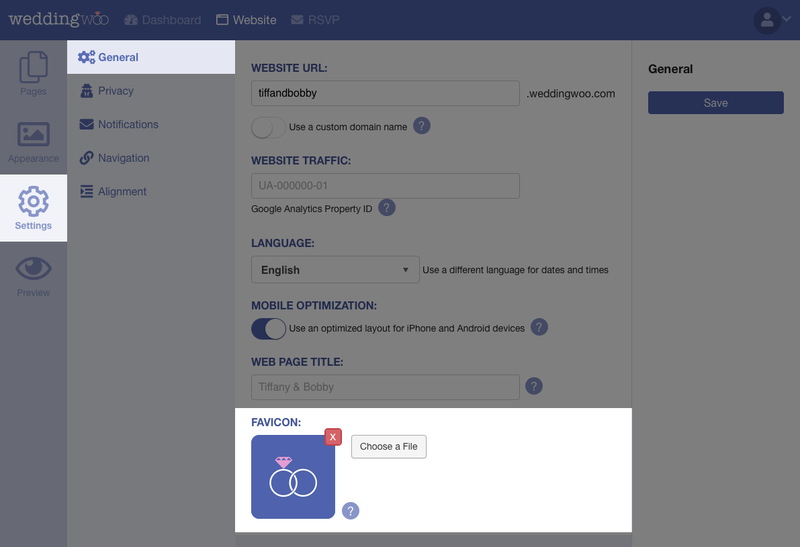 The default favicon is a WeddingWoo logo. To change your favicon, head over to the "Settings" page in your Dashboard. Scroll towards the bottom where you will see a field labeled "Favicon". Once you choose a photo, the upload process will begin immediately. After the upload is successfully completed, your chosen image will show up as the favicon. You can also remove your chosen image at any point. Once you navigate to your website, you should see your favicon display in the browser. Navigate to your website from Safari in iOS on either iPhone or iPad. Click on the share button pictured above. You'll see sharing options. Tap on the "Add to Home Screen" option. You'll have the option to customize the title which will be the text directly under the touch icon. The default title will display the page title from the website. Once you click on "Add", your website will now show up on your Home Screen with the favicon you uploaded as the touch icon. It is bookmarked so you can directly go to your website at any point. If you decide to share your website with friends on Facebook, we've included your favicon as part of the preview image when you share your URL. The high resolution of your favicon will be used by Facebook to display the image along with your status update shared to your Timeline. This way, your shared URL will have more visual prominence in your friends' newsfeeds.